Terry and I drove to Isle of Palms early in the hopes of avoiding the July 4th traffic rush to the beach. Since we were several hours early we found the Sea Island grill and sat outside by the pool to relax. Terry ordered a coffee and I ordered a very weak lemonade. After the first tasteless sip I forgot about my drink. 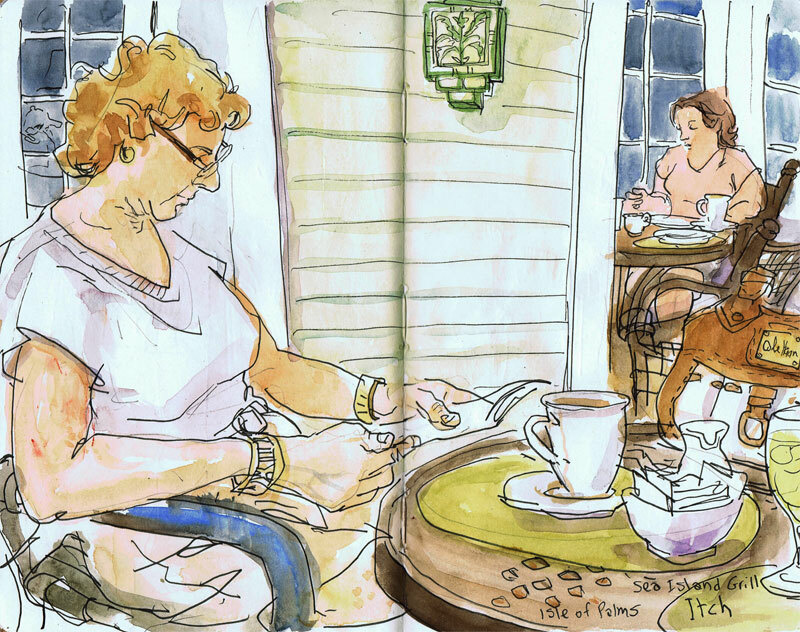 There were very few people seated outside so I focused my attention on Terry who was reading her New York magazine. If we ever move back to NYC she will have insights to every neighborhood. She has been reading that magazine since we met 23 years ago. Terry's cousins own a condo right on the beach. Barbecue hot dogs and burgers were being prepared. After a few snacks and sodas everyone headed down to the beach. I slathered some sun block on Terry's back and we ventured into the water. Robbie who is a journalist waded out with us. The water was much colder than the water at Coco Beach in Florida. The first tentative steps were the coldest. Once my bathing suit was wet it was easier to dive in all the way. Well, I didn't actually dive, since I had on a baseball cap and my glasses. I wanted to be able to see the waves. I love jumping up with each swell trying to ride over the wave before it breaks. One wave was just too large. It caught me by surprise causing me to tumble backward doing a flip under water. I felt my glasses flying off underwater and I reached out blindly and they danced on my finger tips before I grasped them. The cap found it's way to the surface later and I scooped it up from the foam. We decided to go back to the beach towels and drop off the glasses. We rushed right back out. I enjoy the persistent strategy of trying to predict and ride over each wave. It reminds me of dodge ball which I used to enjoy playing in gym. Terry was enjoying the surf as well and for once we could laugh and play like kids. Robbie was talking about his proposed blog so much that I lost sight of the waves behind me and I was again swamped and tossed like a rag doll. Each time I was caught by surprise I would sputter and stand up to the continuing onslaught with renewed enthusiasm. I saw Terry go under as well, and she also faced each new wave with childish buoyancy and delight. I enjoy the strong foreground figure in this one...thanks!